Your neighbor, cousin, grocery store check-out lady or whoever you happen to most discuss Gonzaga basketball with is going to tell you that Gonzaga shouldn't have played such a close game on Friday night. This is probably true, but in the NCAA tournament, a win is a win. "Survive and advance" — ever heard of that? 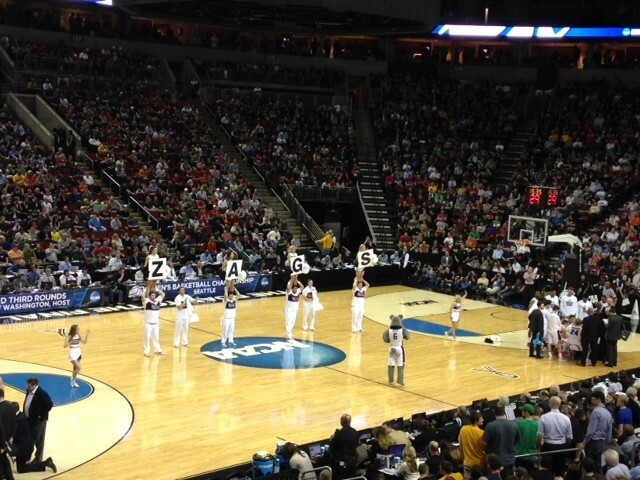 The Zags were happy to walk out of Key Arena with a ticket to play Iowa on Sunday afternoon (4:10 pm tipoff, TBS). The 86-76 final score as skewed slightly by some end-of-game threes, but that's just about how close the contest was throughout. North Dakota State is a scrappy, albeit undersized, crew who gave Gonzaga players and fans more heartburn than they expected from this 15-vs-2 matchup. Should it make you nervous that the Zags let an ostensibly lowly opponent shoot better than 53 percent from the field, including 10 of 21 from three point territory? Yes, probably. But don't expect coach Mark Few to apologize for not serving up the 30-point victory some folks think was required. "Especially sitting there watching all those games transpire over the weekend and just how tough it was for everybody out there. We knew this was going to be tough. But, again, these guys stepped up and made enough big plays down the stretch, especially on the offensive end to hold off a really, really courageous and bighearted opponent," said Few after the game. The nightcap of an entertaining slate of games in Seattle started precariously for the Zags when NDSU went three-for-three from downtown right after the tip off and at one point had a 5-point lead that had the mighty Gonzaga contingent in Key Arena wringing its collective hands. The Zags would roll out a 12-0 run punctuated by a breakaway jam by Seattle's own (well, Kent actually, but whatever) Gary Bell Jr who finished with 13 points. The pride of Spokane headed into the locker room at halftime with a comfortable 43-30 lead...but Zag Nation didn't get to kick back, which is what you want to do in a 15-2 matchup. The Bison (with a hard Z), were led by a 6-foot-6 guy who looked like he just stepped out of a transmission repair shop and onto the court. I guessed his name to be Buzz Porkchop and I was close...he goes by Dexter Werner and he made an array of ridiculous shots against guys half a foot taller than him. It made little sense, but that's kind of the way the NCAA tournament works. What was the difference? Kevin Pangos. The senior Canadian came alive, hitting 18 points on four 3-pointers, including a four-point play that put a soldering iron through the hopes of the NDSU Bizzzzzzzon. On Sunday, the Zags go up against a very, very tough looking Iowa team that dispatched A-10 champion Davidson, with the hopes of making their first Sweet 16 since 2009. "I don't know about getting over the hump. We have done it many times in this program, so for us, we need to play better... obviously we need to play better on the defensive end Sunday because of all the teams this weekend, I thought Iowa probably had the most impressive performance, at least that I saw. So, they're clicking on all cylinders and we got 36 hours to get back and get our feet under us and get rested and hopefully come out and play a great game," said Few. A former DSP president's assessment of Spokane's economy, "good-old-boy culture"